The four-star Suite della Vite Guest House offers luxurious accommodations just steps away from the historic heart of Rome and its fabulous sights of Piazza di Spagna, the Spanish Steps, the Trevi Fountain, to name a few.Set in the elegant 18th century building, this boutique hotel has a unique atmosphere of grandeur and style while the cutting edge amenities make it extremely cozy and functional. Free Wi-Fi is available in the entire property.Six individually designed guestrooms are appointed with attention to every detail and feature Nespresso coffee machines, free mini-bar, LCD TVs and other comforts.The on-site restaurant serves traditional Italian and Mediterranean dishes in a refined yet relaxing ambiance.The hotel is close to Roma Termini Railway which provides a quick access to Fiumicino airport. 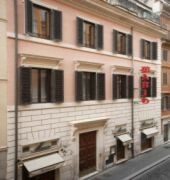 The Hotel Suite Della Vite is a Tourist hotel. Located in ROME area. Shopping is within walking distance and the nightlife/restaurants are located in the hotel. 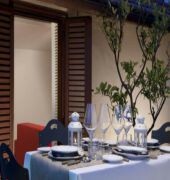 Descriptionclass="small" style="text-align: justify; font-size:11px;">The four-star Suite della Vite Guest House offers luxurious accommodations just steps away from the historic heart of Rome and its fabulous sights of Piazza di Spagna, the Spanish Steps, the Trevi Fountain, to name a few.Set in the elegant 18th century building, this boutique hotel has a unique atmosphere of grandeur and style while the cutting edge amenities make it extremely cozy and functional. Free Wi-Fi is available in the entire property.Six individually designed guestrooms are appointed with attention to every detail and feature Nespresso coffee machines, free mini-bar, LCD TVs and other comforts.The on-site restaurant serves traditional Italian and Mediterranean dishes in a refined yet relaxing ambiance.The hotel is close to Roma Termini Railway which provides a quick access to Fiumicino airport.